This family was revised, to consist entirely of the genus Pelobates, which occurs in western Eurasia and northwestern Africa. Species of this family have striking similarities to the family Scaphiopodae, in which the genera Spea and Scaphiopus occur throughout North America. 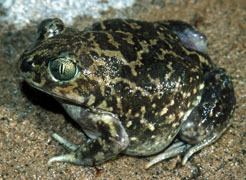 They are collectively known as the "spadefoot toads" due to the presence of a keratinized "spade" on each hind foot which are used in burrowing. While all spadefoot toads were once thought to be in Pelobatidae, more recent phylogenetic analysis reveal that Pelobates is closer to Mygophryidae than Scaphiopodae. Pelobatids inhabit arid habitats and are known as explosive breeders due to their seeming to explode out of the ground after the first heavy rain in order to mate. They produce tadpoles that develop rapidly in temporary ponds, even in desert regions. They have short legs and stocky bodies with vertical pupils.